Audible, the leading provider of audiobooks with over 180,000 titles. Get your free audiobook at audible.com/twist. Media theorist and author Douglas Rushkoff joins Jason to discuss the current economic environment. 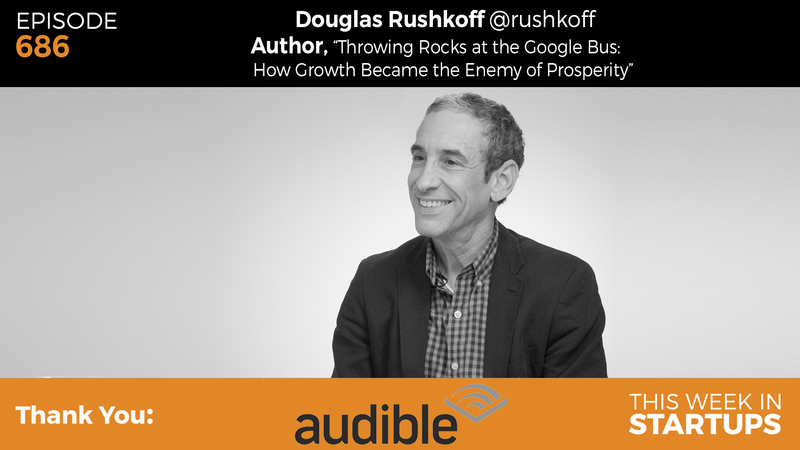 The two talk about Douglas’ latest thought-provoking book, “Throwing Rocks at the Google Bus: How Growth Became the Enemy of Prosperity,” the digital economy, the growth trap, and solutions to create sustainable marketplaces for the future. Douglas presents the problem that digital companies extract value without distributing wealth. They’re taking money and value away from us and storing it in share price. He argues that you should make everyone in your ecosystem wealthy–your customers/vendors/suppliers–then you can circulate money, rather than just extract it. Join us and learn how and why we went wrong, and how we can reprogram the digital economy and our businesses to promote sustainable prosperity for everyone.